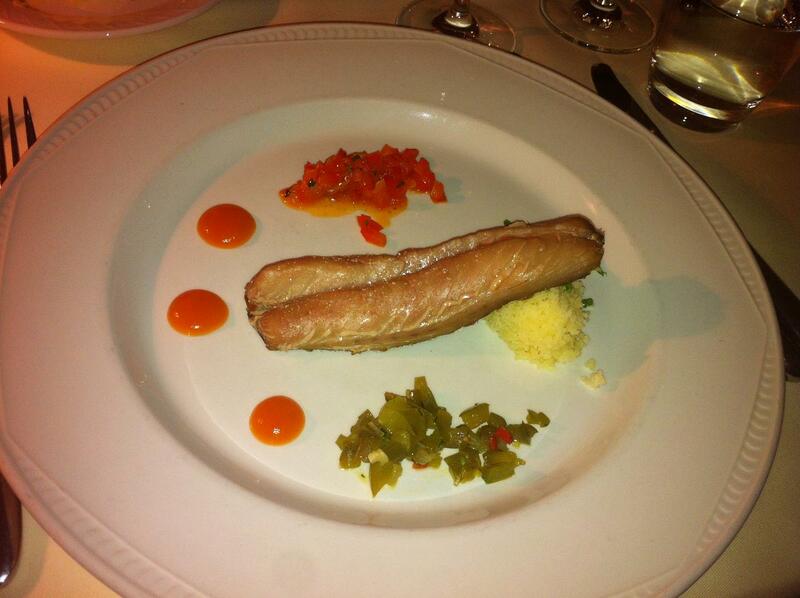 The next dish was not my piece of cake, it was mackerel, with a salsa of green and red peppers, a couscous and home made ketchup. well, what can I say. 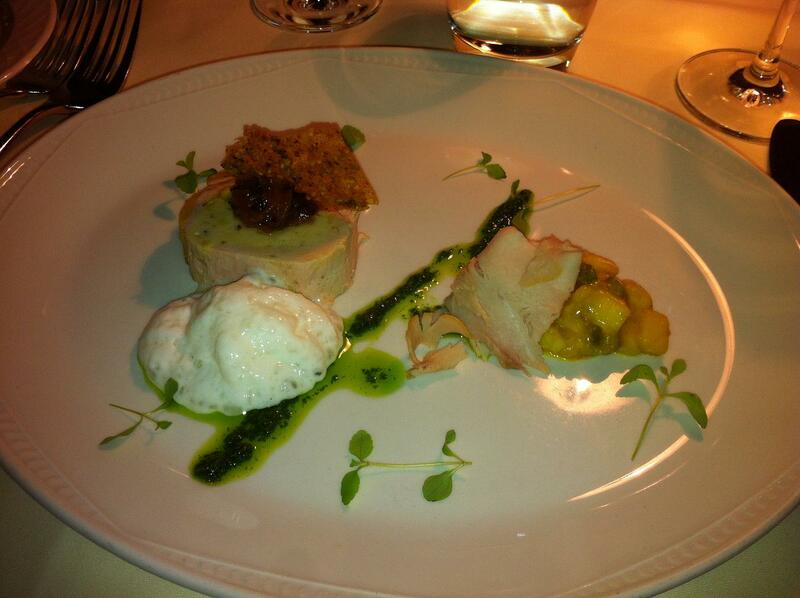 First: messy dish, what are these things doing together on one plate? What’s with the couscous? 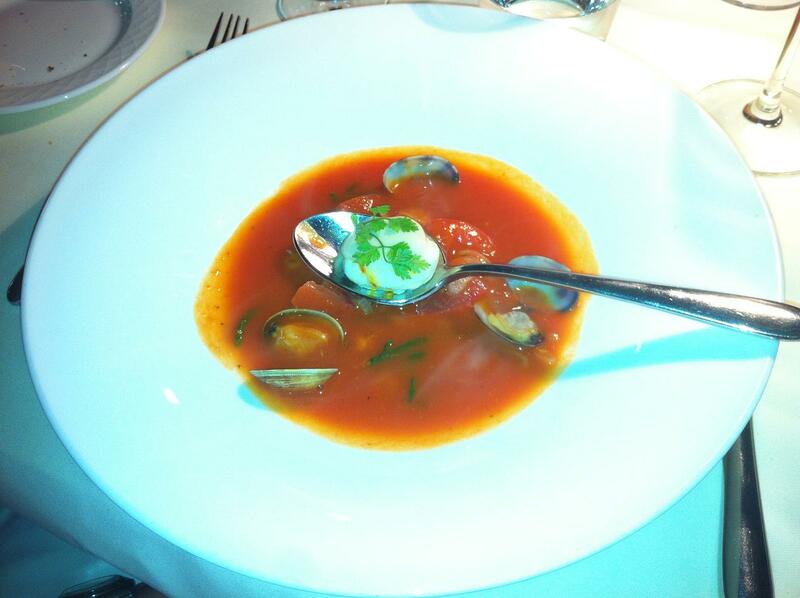 I did not like the mackerel at all, it had a strange acidity, and gave me a strange tickling feeling in the mouth. The salsa and ketchup however were really good, but would have combined better with, well, yes, a burger or so :-). 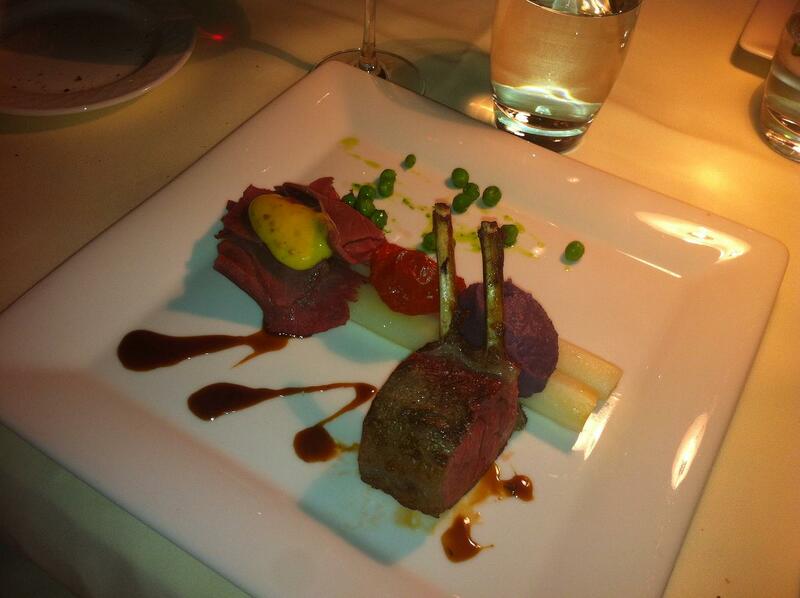 The main main course was indeed nices, Lamb ribs and lamb ham, with mashed purple potatoes (with truffle oil, nice!) on 2 asparagus and with 7 peas. The meat was very very well done, it was quite raw, but clearly good quality, the tast was great. 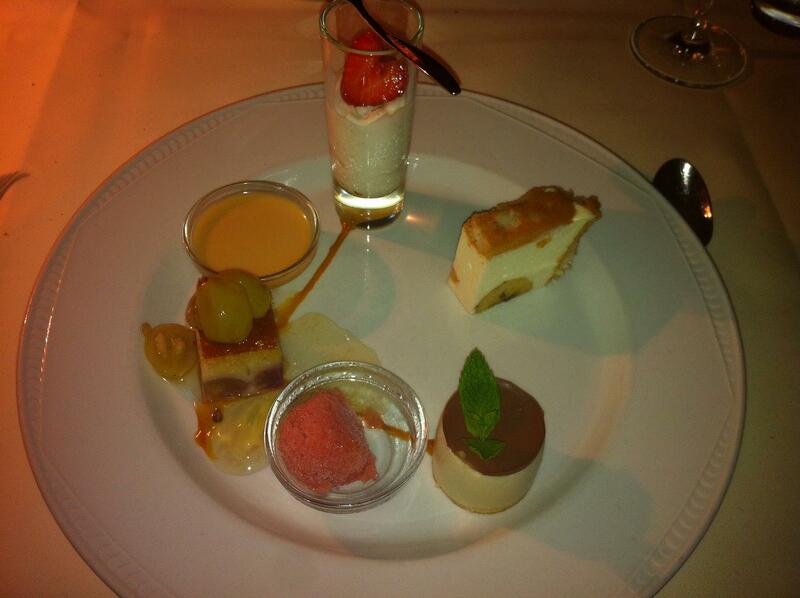 the dinner ended with a grand desert, with 6 small desserts, from the trolley menue. It included some strawberry like icecream, a mouse, a caramel thingy, something with tonka beans and something with yoghurt and vanilla. All in all ok, quite sweet, but something nice for everyone, I think. (all in all this is, although portions are tiny) quite a huge dessert by the way). So? My opinion in general? This is a good restaurant, service is very kind and good, food is mostly good to very good, wines were good too. However, I wouldn’t go here for every occasion. It is a little stiff, i don’t really like the interior (although it is light and quiet), it’s a bit boring, but for instance for a family dinner, it is quite ok. 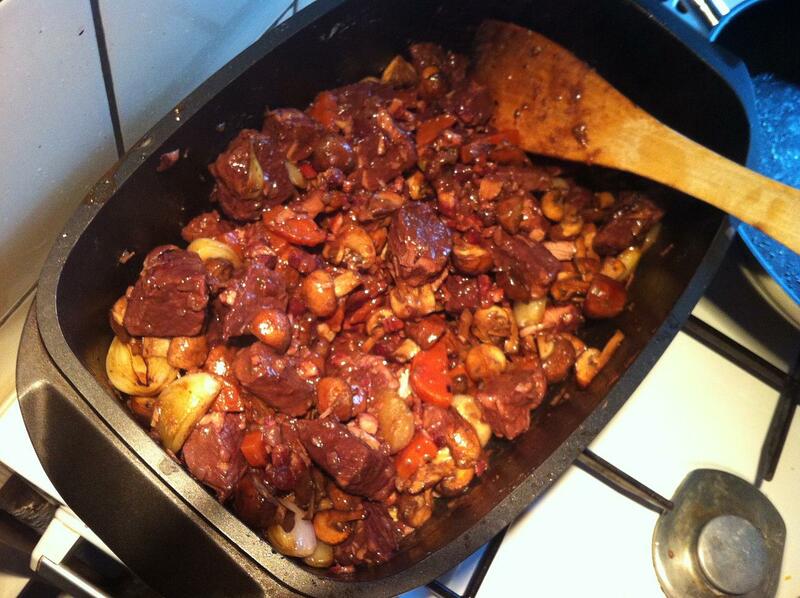 This entry was posted in ate and tagged de Pauw; on May 30, 2012 by esthercooks. Last week I was in Berlin for work. Always nice to go to Berlin of course, and this visit was no exception. I especially looked forward to my visit, because a colleague and I planned to go and eat VIetnamese at Monsieur Vuong‘s. I got recommendations for Monsieur Vuongs from several people, so as soon as we had a longer lunch time break, we left the conference and took the U-Bahn to Rosa Luxemburgplatz. From there it is just a short walk to M. Vuong. We were lucky, it is not possible to reserve a table there, and it is very popular, so we expected we had to wait a little, but within 5 minutes there was a table free outside for us. Great! Even the sun started shining. Two of us ordered curries, I ordered glass noodles with small beef stripes and veggies. We had a yellow, a red and a green shake, and they were all great (mango-coconut, raspberry, and apple-mint) and fresh. The food was just as fresh, and it was in one word: delicious! I am pretty sure that from now on, whenever I am in Berlin, I will go there. Very authentic taste, really fresh products, spicy, but in a nice way. Yummy! Apart from that prices are more than reasonable, we paid 35 Euros for three meals, which I think is more than ok.
By the way, on one of the other days we visited another very nice Asian restaurant, Asian Deli,(yes, bad colours on their website), in Prenzlauerberg. Also very good (not as good as Vuong though), they have dishes from Indonesia and Maleisia as well as Vietnam, and more choice in general. I really like there Coconut Soup with fresh pieces of coconut in it. As a main course I had chicken with vegetables, cashew nuts, and peanut sauce and rice. Nice and spicy, but not all vegetables were as nice and fresh as in Vuongs. Yet, still a great meal, and this restaurant is even cheaper than Mr. Vuong, so it’s a bargain. Go visit them if you’re in Prenzlauerberg! This entry was posted in ate, drank and tagged asian deli, monsieur vuong; noodles; vietnamese; Berlin on May 21, 2012 by esthercooks. A very nice challenge, because I really like this kind of food. Meat that is sitting in the oven for hours (in a whole bottle of red wine! 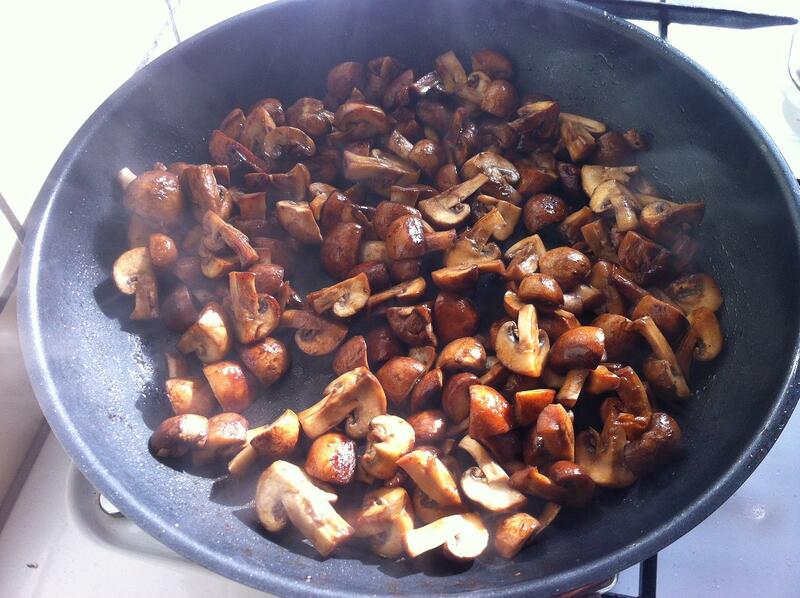 ), champignons slowly baked, perfect! Moreover, Fabi wanted us to make the Julia Child version. This version I knew, cause I ate it (a friend of mine made it once for me), and I liked it a lot. I really would like to have the Julia Child cookbook sometime myself, but this gave me the opportunity to make one of her recipes already. Great, thanks Fabi for your work on this challenge. and the end result. Approved by my girlfriend as well as my mother in law, so I guess I will be making it again! I have no problem with that at all, it was great fun to make it. During the whole process there were basically only two real challenges. 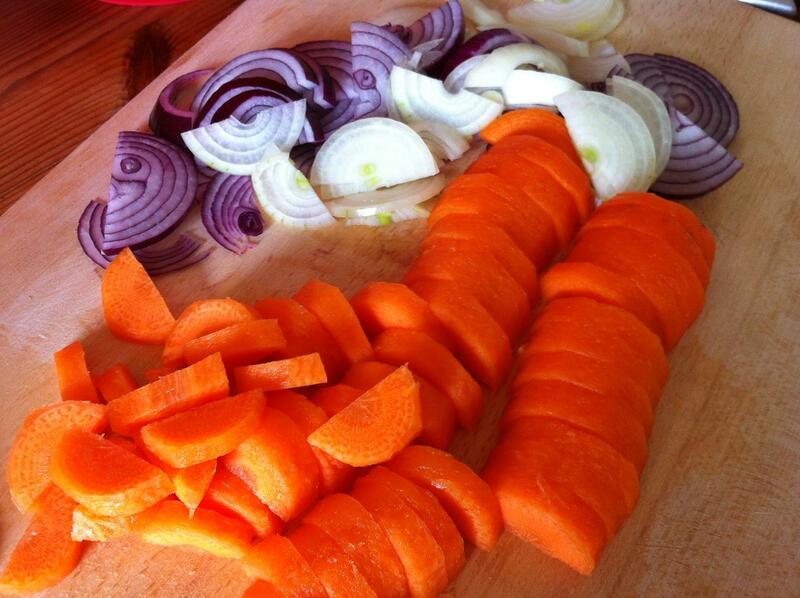 First, I could not find the very nice small onions that are needed here. Probably I should order them on beforehand, but well, I guess I am not organized enough for that. 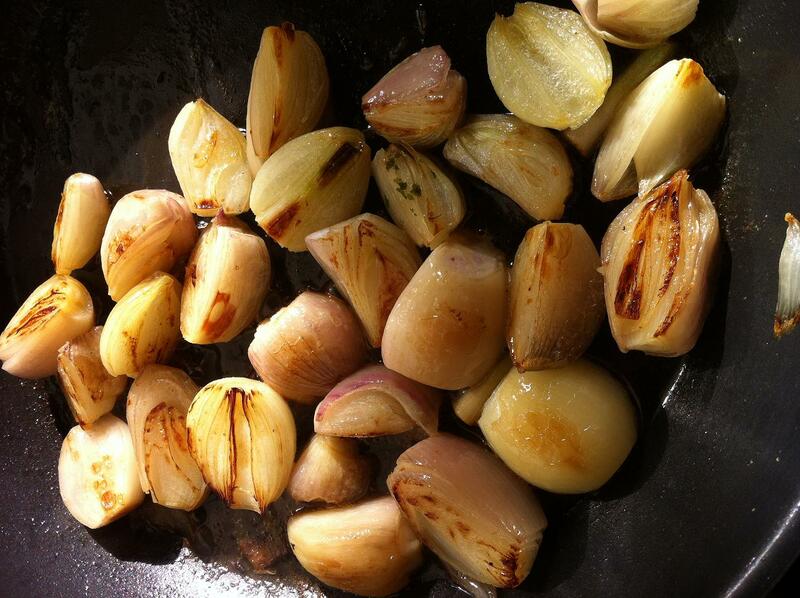 Instead I used shallots, and this I halfed because they were still quite big. It turned out in the end that I had not cooked them long enough, they were not completely through, which for this dish is not so nice. The second problem was the meat, I had gotten beautiful looking beef, but, when I started sauteing, it lost a lot of water, and hence I could not get a nice golden brown crust. 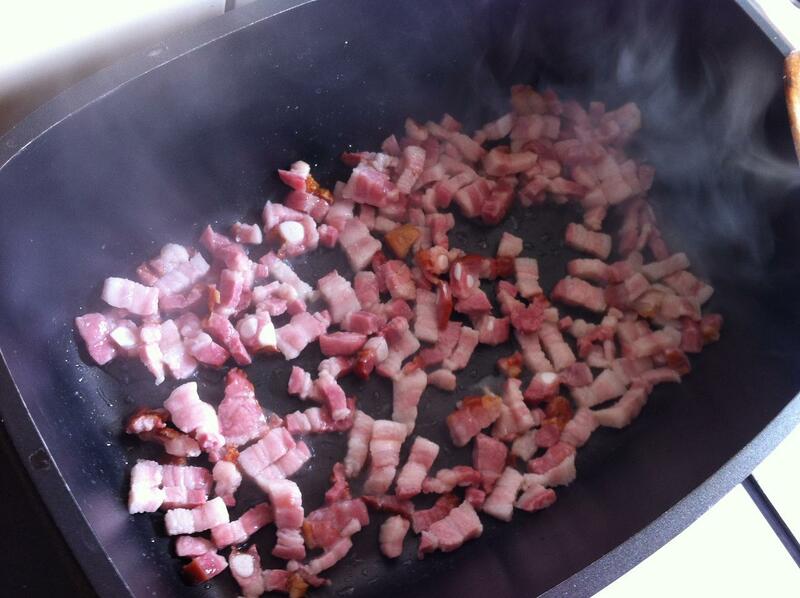 The pan was hot enough, I had just sauteed the speck in it, which worked out well, so that could not have been the problem. I guess or am afraid that the meat had been frozen before and hence had so much water in it. Not so nice. For the endresult is was ok, but still the meat was a little on the dry side. Not so much that I was disappointed, but still. Could this be the reason? The meat being frozen before? Next time I’ll ask my butcher. 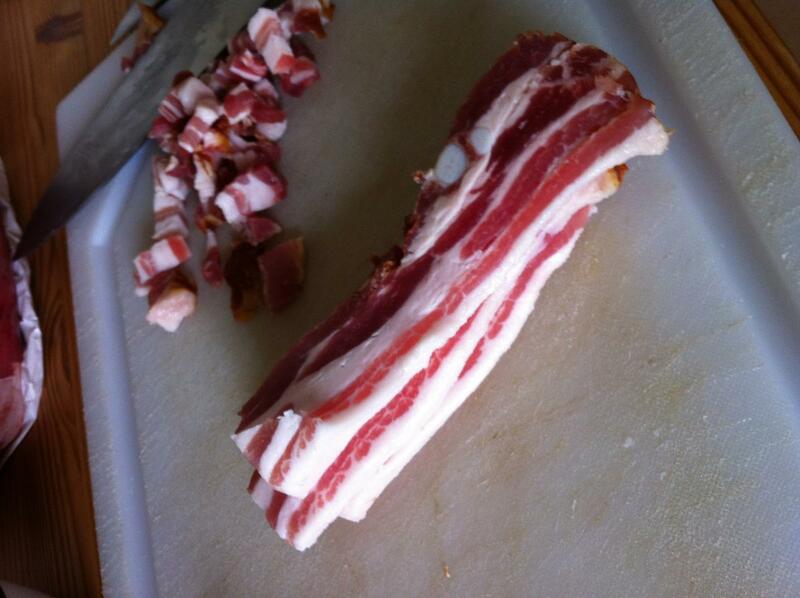 anyway: a will-make again recipe, great smell, lots of fun, great taste! 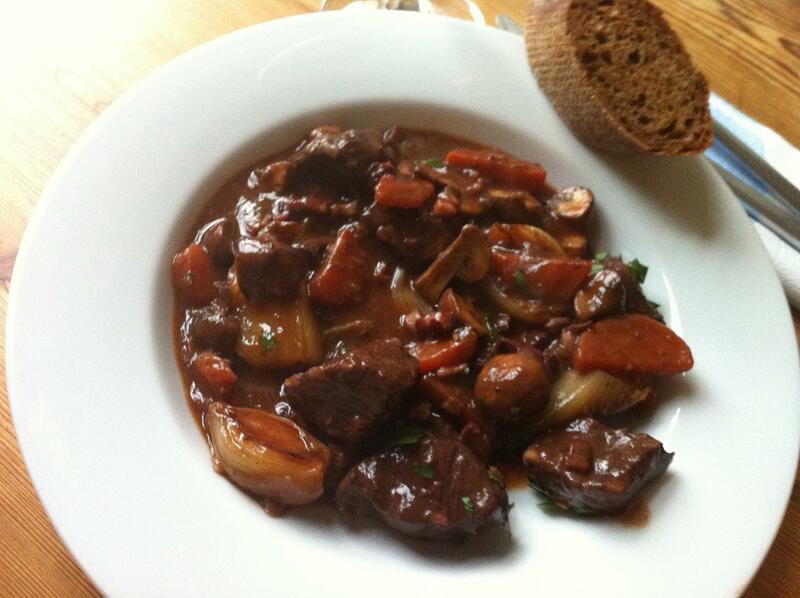 This entry was posted in ate, cooked, Uncategorized and tagged boeuf bourguignon, daring cooks, fabsfood on May 14, 2012 by esthercooks. A while ago, I bought the Ottolenghi Cookbook ‘Plenty’, and although I was immediately enthusiastic about it, it took me a while to get cooking from it (basically because i was to busy renovating, gardening and working, which means most of the times to exhausted to even think of trying something new.). But about a week ago or so, i took some time to look through it again, and just really wanted to get started on some of the recipes. Last friday we had a visitor for dinner, so, time to go ahead. The first is from the first stage, mixing the garlic, carrots, red onions with good olive oil, thymian and rosemary (fresh of course) before putting it in the oven for about 20-30 minutes. 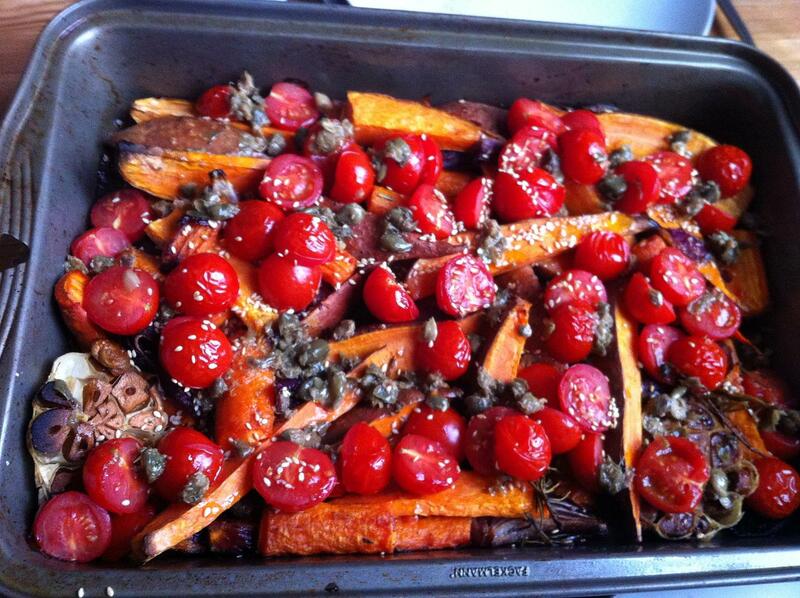 Then I added the sweet potatoes, and 40-45 minutes later the halved cherry tomatoes were added for another 10 minutes. In the end I put some roasted sesame seeds (optional in the recipe, I was glad I added them though, fits perfect to the other tastes) and of course finally the special capern dressing, made out of oil, capern, some mustard and maple syrup and some vinegar. See the second picture, isn’t that just lovely? We served it with grilled lamb chops (good idea, but one can also eat it without meat) and some bread, and all agreed this was a perfect dish, which we sure need to make more often. The combination of the sweet vegetables, sweet from the slow roasting, and the fresh dressing is incredibly nice. The addition of the capern adds for an new taste, not something very familiar (that is, to me, in this combination), but really refined. Good recipe, and lots of fun to make too! 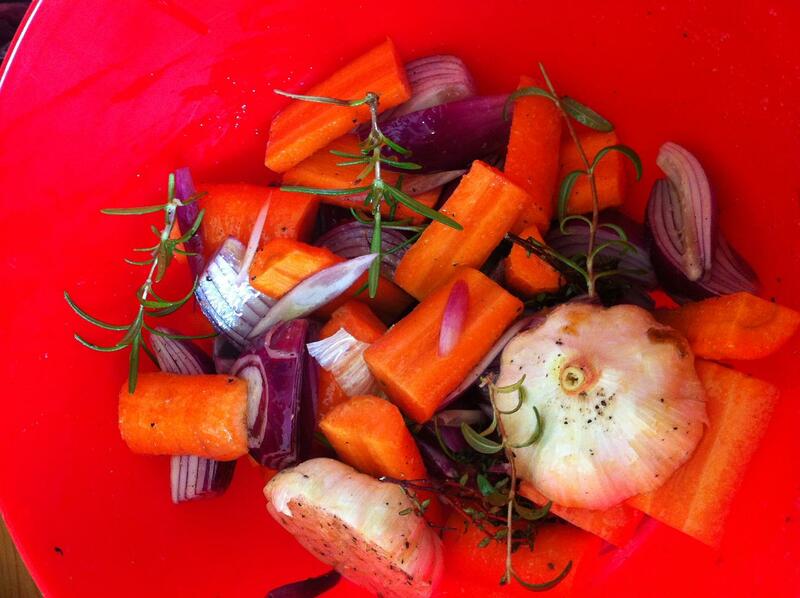 This entry was posted in ate, cooked and tagged ottolenghi; roasted vegetables; capern on May 1, 2012 by esthercooks.